Today feels pretty special as we are finally introducing something that we have had in the works for a while. Upholstered seating and lounge areas have become a popular “must have” for weddings and events recently and we completely understand why! We love the idea of bringing the “inside out”, creating a comfy place for your guests to relax, or setting up a gorgeous backdrop for photos. Whatever your reason for wanting to incorporating a lounge area, we get it and we wanted to make envisioning how this might look at your wedding a little bit easier. We are starting with the first seven of these styled lounge areas and we plan to create more as we continue to curate our collection. So without further ado, let me introduce you to them! Meet Lucía. 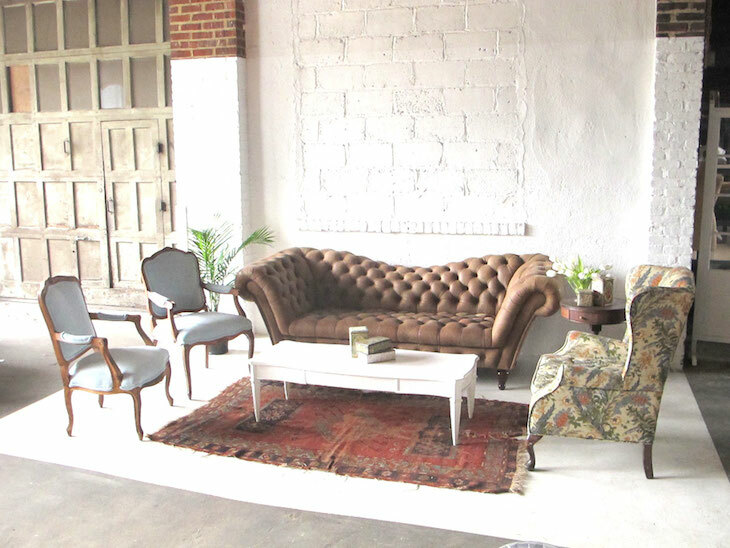 This boho inspired lounge area is perfect for an easy breezy summer wedding or really anytime of course. 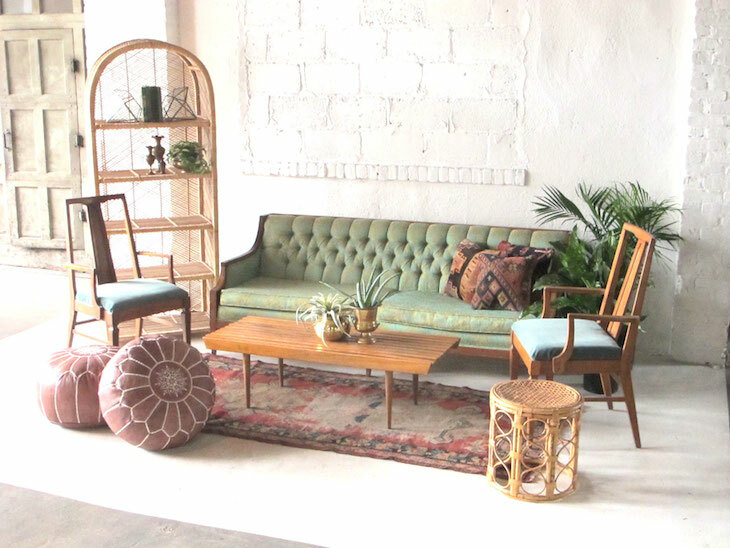 This seating area includes a mod mint and gold patterned Bardot couch, two mint arm chairs, a midcentury modern slat coffee table, 3 Turkish pillows, a vintage rug, a rattan side table and shelf and two Moroccan leather poufs. Not to mention the three books, 2 geo terrariums, 3 brass bud vases and 2 brass urns! It is hard to pick a favorite but this one is definitely at the top of my list! Meet Hudson. This seating area is slightly more masculine and designed with a neutral palette in mind. 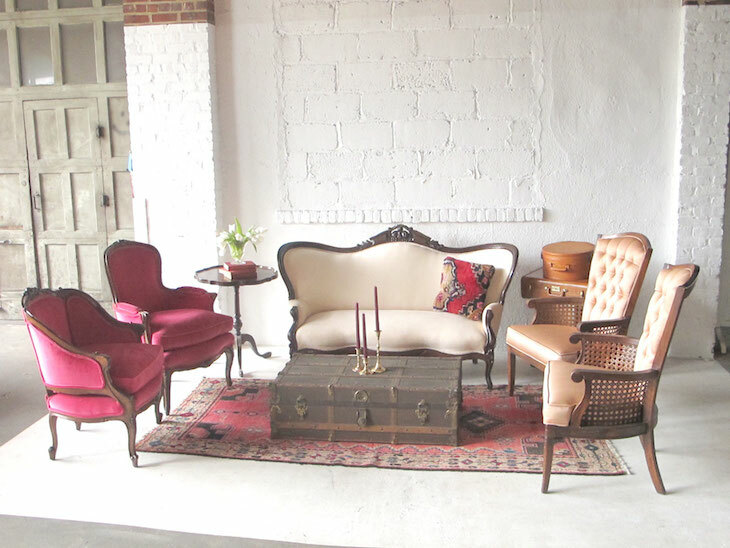 The Lil’ Admiral sofa is the standout flanked by our gorgeous cane back Chanterelle chairs. Two authentic tree stumps, a rattan side table, and our antique wooden box coffee table allow for plenty of room for drinks or cigars. 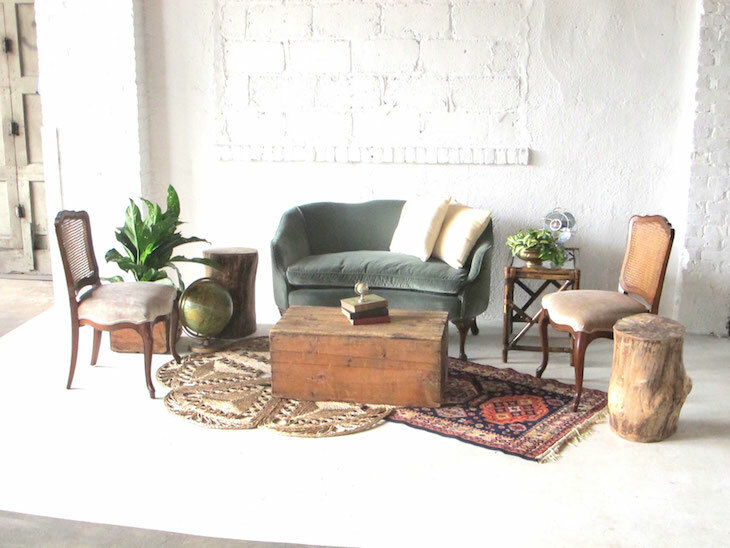 To accessorize with a nod to the adventurer, we have included two vintage globes, an antique fan, a milk crate, three vintage books, two beige pillows and not one, but two awesome rugs. This lounge area is so warm and inviting and perfect for a fall wedding! Meet Begonia. This lounge area is definitely a little flirty! With tones of hot pink, blush and peach- she sure is a knock out! Included in this styled area are our Crawford and Campbell chairs, Petal blush settee and two Cecily armchairs. Our favorite pink vintage rug with an antique trunk and the Grace side table make her cozy for cocktails. Three brass candlesticks, two cognac brown suitcases, two crates, a Turkish pillow and 3 vintage books sure make this lady a real head-turner! Meet Caspian. A nod to the nautical or seafaring folk, this seating area features the Rivington Sofa, Olivia chair and a gorgeous blue arm chair all paired with a stunner of a rug. For a touch of whimsy, we incorporated our lobster trap and steamer trunk as coffee and side tables. Atop the barrel, you will find a silver globe, vintage lunchbox, vintage books, and sea glass inspired bottles to round out the look and don’t forget the anchor! Meet Fitzgerald. This 20’s inspired lounge area is all about the gold. Our Willow sofa is a soft grey 3-seater with gilded details paired gorgeously with a pair of Adelaide chairs on top of an antique blush and blue rug. 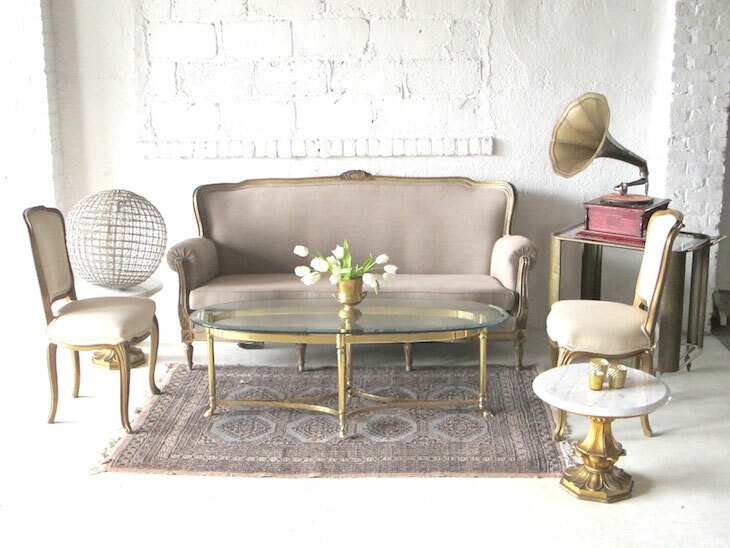 Two gold and marble side tables, a brass and glass coffee table and a brass bar cart with a vintage victrola and French crystal chandelier surely exclaim elegance and luxury. Meet Timberline. This lounge area reminds me of visiting an old friend. This tufted leather beauty would make any guest comfortable. Two Astrid baby blue velvet arm chairs and one unique patterned wingback chair on top of a vintage rug. 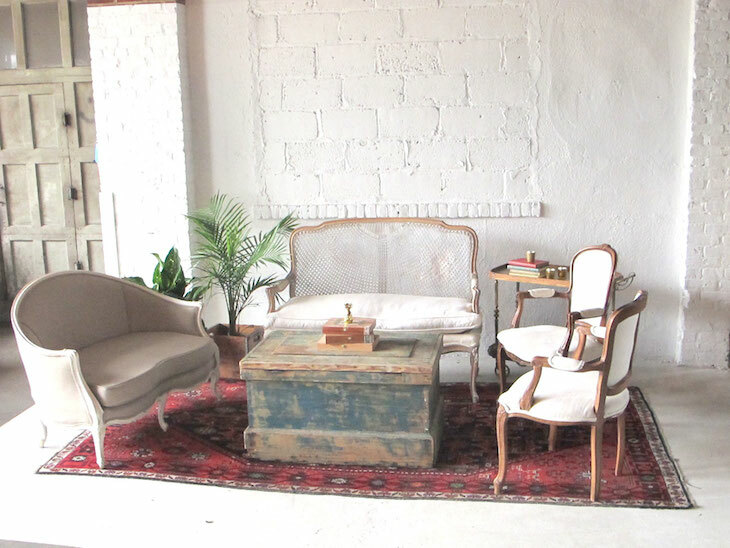 Rounding out this seating area is a white wooden coffee table, a round side table and five vintage tins. This lounge is definitely perfect for a cozy cocktail hour or a cigar lounge. Meet Havana. I may have saved the best for last! This little beauty is neutral but with a pop of color in the red vintage rug! The one-of-a-kind Alma white caneback couch tries to steal the show but not to be outdone by the lovely grey linen loveseat and white velvet armchairs. Swoon! 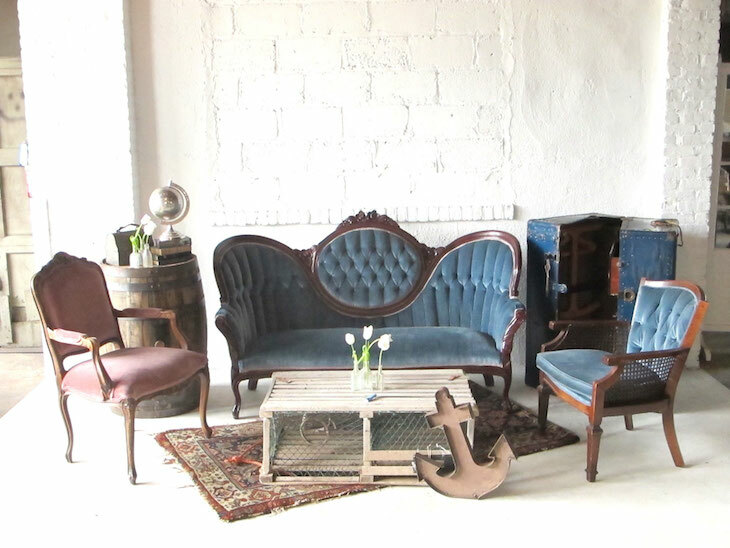 I am so in love with this distressed blue trunk and brass and wood bar cart! We have included the cutest little brass pineapple, three wooden cigar boxes, vintage books, gold mercury votive holders and a crate (perfect for incorporating a plant). This lounge was made for the nightlife! We hope you are loving our lounge areas as much as we are! We can’t wait to hear which one is your favorite! Please send us an email or make a wishlist on our website to reserve your styled lounge for your wedding or special event!